The Swag’s restaurant and inn must be discussed in the same breath, because an evening meal here is an intimate occasion shared with guests. You’re likely to meet many out-of-towners over drinks on the deck or while lounging in Adirondack chairs on the sprawling meadow out front. Since 1982, this exclusive getaway has been a peaceful oasis, earnings spots on Conde Nast Traveler and Zagat’s top hotels lists. A kitchen garden provides fresh herbs, heirloom tomatoes, and other produce for the menu, which changes daily. What the garden doesn’t provide, Chef Bryan Kimmett buys from local farmers. 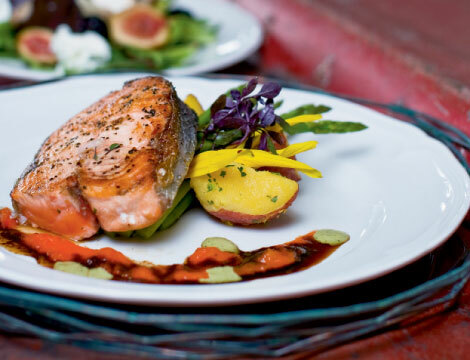 And because the inn is open only April through November, meals are influenced by the seasons. “I’m inspired by local farmers and what they have to show me,” says Kimmett. For the four-course, prix fixé meal, guests commune over the chef’s selection of starters, then choose between three entrées. Diners “brown bag” their wine (the area is dry) to pair with pan-seared antelope and garlicky, crisp haricot vert, or spinach and ricotta dumplings with nutmeg and fried sage. The fall menu includes cassoulet with venison, rabbit sausage, whiskey-fennel sausage, beans, and grilled vegetables simmered in Vermont maple syrup game stock, as well as preserved pheasant on black-eyed pea cakes with dried fig-loganberry chutney, among other complex and delicious pairings. After finishing the meal with blackberry or rhubarb-mango crisp and homemade ice cream, take the opportunity to stroll the adjacent forest paths on the 250-acre property and reflect on what so many travel here to enjoy—a grand meal in the Smokies.